Complete the Scene with Accessories for Photo Booths! Make your event have a true red carpet feel by adding a few touches to finish the look. We have exactly what you need to make sure your event looks great and your guests will be impressed. Add our stainless steel stanchion posts to your photo booth area for a high-end Hollywood feel. These stanchions are anti-rust and flawless looking with a high sheen. For most photo booth setups, we recommend three stanchion posts and two ropes minimum. Rope dimensions: 1.26" x 59"
Give your event an upscale feel with our red carpet runners, are great for parties, weddings, award presentations, ceremonies and other special events! Our red carpets are also the perfect addition to your photo booth rental to set the scene of your guests. 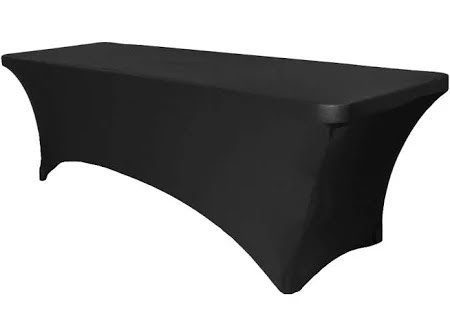 Keep your photo booth area clean and tidy with our 6' prop table with black spandex linen for a sharp, professional look. Book a Photo Booth Add-On Now!